The big news of the day is the conclusion of a stalemate between the Winnipeg Jets and defenseman Jacob Trouba. He’s reportedly set to sign a two-year, $6 million contract that will pay him a prorated $2.5 million this season and $3.5 million next season, according to ESPN’s Craig Custance. With a bevy of injuries, including right-shot Tyler Myers, bringing Trouba back into the fold is a huge get for the Jets, especially at this reasonable price. For Trouba, who requested a trade before the start of the season, getting back on the ice ought to help his trade value. The team-friendly cap hit will also help his trade value. Any team that acquired him before now would have had to engage in contract negotiations and he had been rumored to be requesting a bit more than this. With the price tag set, teams know what they’re getting into and won’t have to wait long to negotiate an extension with the 22-year-old defender. He’s eligible to sign an extension as early as July 1. However, the team has always wanted Trouba to stay in town and general manager Kevin Cheveldayoff was choosing his words carefully when speaking with the media Monday. “Jacob Trouba is a Winnipeg Jet,” he said. This signing will impact the cap in some odds ways because it was signed while the season was already in progress. Sportsnet’s Chris Johnston reports that the cap hit for Trouba’s contract will be $3.3088 million this season and $2.8125 next season. Though he’s made efforts to distract fans with fake names, owner Bill Foley is said to have trademarked three names so far: the Golden Knights, the Silver Knights and the Desert Knights. He’s also previously confirmed that the team will likely be named (something) Knights. The St. Louis Blues have placed defenseman Joel Edmundson on injured reserve after he suffered an upper-body injury in Sunday’s game against the Colorado Avalanche. The team announced he will be reevaluated in three weeks. Edmundson has played 13 games for the Blues this season, registering a single assist. In response, the team has called up defenseman Petteri Lindbohm to the NHL. They have also assigned forward Ty Rattie to the Chicago Wolves of the AHL on a conditioning loan. 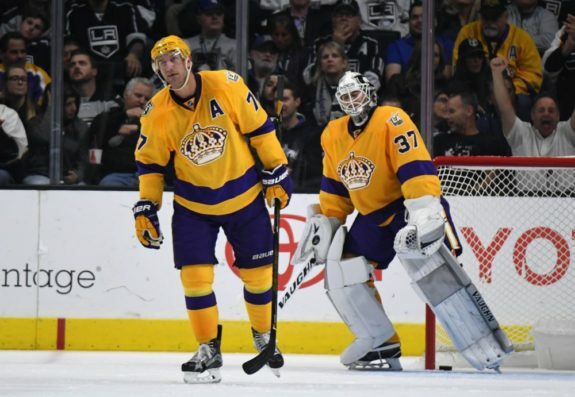 – Still struggling with the long-term absence of starting netminder Jonathan Quick, the Los Angeles Kings got some good news Monday. They have activated backup netminder Jeff Zatkoff from injured reserve. In a related move, the team has reassigned Jack Campbell to the AHL’s Ontario Reign. – Projected to be a first-round pick in the 2017 draft, Casey Mittelstadt has been named the USHL’s Forward of the Week. He’s now on a five-game point streak after posting a pair of multi-point games over the weekend. The Eden Prairie, Minn. native currently leads the USHL with 20 points in 14 games. – On the eve of the U.S. election, a new candidate has thrown his hat into the ring.